The cache pit played an extremely important role in the survival of the Upper Missouri Tribes. A families entire winter food supply was stored in these structures. Families had various numbers of cache pits. Some dug inside of the lodge and some dug outside of the families lodge. These pits were also used for cool storage in the summers. Construction: "Two women worked together in a cache pit, one helping the other out." "The digging and storing of a cache was women's work." Bottom Skin Covering: "The bottom of small cache pits were covered with a small circular piece of skin. The skin was cut to fit the bottom and was laid directly on the grass matting that covered the willow floor. If the cache pit was large, we fitted into the bottom the skin cover of a bull boat, with the willow frame removed." "A Trench for the puncheon cover of the mouth was the very last part of the cache pit to be dug." Strings of Corn: These were the first to be placed in the cache pit. They were placed snugly against the wall of the cache pit, on the bottom skin covering, with the tips of the ears pointing inwards. These strings of corn had been dried on the stage. Shelled or Loose Corn: Second was the loose corn. The corn was poured into the cache pit until it was level with the strings of corn but not covering them. This corn had been threshed in a booth under the drying stage. The smaller ears of dried corn were threshed. 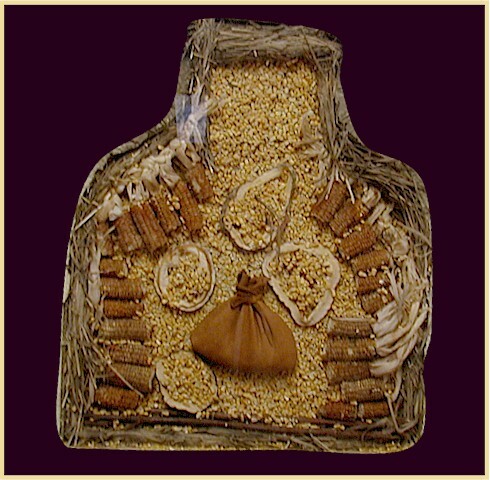 Dried Squash: The squash was coiled and piled up in the center of the cache pit upon the dried corn. The squash was sliced, skewed on a spit, and dried on the stage. Beans: The beans were sometimes placed in cache pits that were outside of the lodges. The beans were put in a bag or bags. The bags were made of skin and about as long as one's arm. Copyright 2011, LewisAndClarkTrail.com - all rights reserved. LewisAndClarkTrail.com and "Re-live the Adventure" are trademarks. Reproduction of any part of this web site, for any use, is prohibited without prior approval of LewisAndClarkTrail.com.